I slept so good the previous night and I woke up feeling 100% better. I got up around 7 am and started my morning ritual of a small camp fire and morning coffee. This was the day I was looking forward to the most. I mapped out two neighboring ghost towns just north of the town of Stanley. The ride there on 75 followed along the Salmon River and it was just jaw-dropping beauty the whole ride up. We passed through the funky western town of Stanley and I think this is one of my favorite towns here so far. It’s an eclectic mix of cowboys, artists, hippies, adventurers, hikers, rafters and colorful locals. 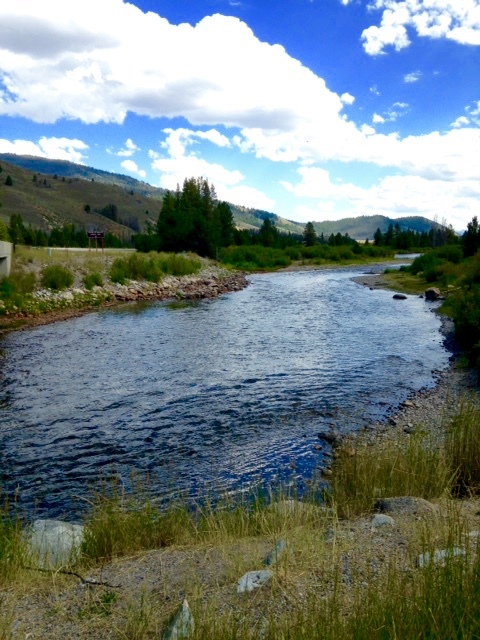 It’s nestled in the Sawtooth and sits on the banks of the pristine and winding Salmon River. Next time, I’ll likely camp or get a cabin in this area. Just past lower Stanley is the turnoff on to North Yankee Fork Road that would lead us up to the ghost towns of Bonanza and Custer. The Yankee Fork Creek, ran along side us as we climbed the twisty turns up to higher elevation. There were many creek names branching off this one, which ultimately all lead to the Salmon River. About 10 miles in, I got excited when I saw the sign that read “pavement ends here” and the road went from smooth pavement to dirt. We passed mounds of trailings, the broken up rock that was left on the sides of the road from mining. Past the mounds of rocks, were small pools. Some with clear blue water and fish, others with a bright green/blue water of sulfur and likely mercury. Beautiful, but I would not swim in this one. 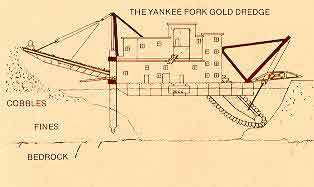 Just before entering the first ghost town, was the Yankee Fork Gold Drudge. It pulls up rock from the river bottom, crushes it, sifts it, saves the valuables (gold and ore) then dumps the trailings out which is what we saw on the sides of the road. The dredge weighs 988 tons, and required only 11 feet of water to float. Kind of sad how this environment was ripped up by dredges and hydro mining, but even so, it’s remarkable how beautiful it still is. Just past the dredge, we stumbled upon the first ghost town of Bonanza. Our first encounter was the town cemetery. There was a sign that listed all who were buried there and many of them also listed the causes of death. Commonalities of death were scarlet fever, typhoid, snow slides (while mining) and quite a number of suicides. Other less common deaths were sawmill accidents and morphine overdose. After checking out the cemetery, we then came upon the few remnants of what was left of the town of Bonanza. Bonanza (Spanish for prosperity) was established in 1877 and lots went anywhere from $40 to $300. 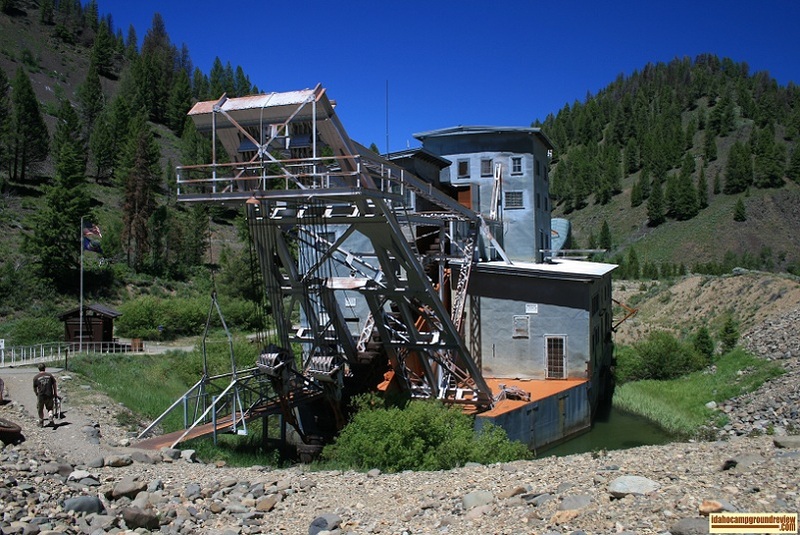 Mining machinery was brought in by mules on a rugged 84 mile road from Ketchum. No easy task. Bonanza became the hub and had around 600 people at it’s peak but two fires (within about 8 years of each other) caused people to give up and move upstream to Custer, which was just 2 miles away. We rode out of Bonanza and headed on to the neighboring ghost town of Custer. This town had a lot more structures still intact as well as a few small museums of artifacts and mining equipment that was left. This town was laid out just below the General Custer mill site (founded in 1879), with homes extending down one street for about a half mile, but now only a handful remain standing. Mike at what once was the town saloon, now mercantile. Unfortunately, town residents passed a law forbidding Chinese people to live within the town limits, so Chinatown developed just below the town of Custer. They were not allowed to mine in the bigger, prosperous mines. They were only allowed to mine on low-grade properties and work as launderers, or cooks. The Chinese artifacts left behind were things such as colorful satin stitched boxes and delicate tea sets. After we were done exploring Custer, it was time to head back out. We spent nearly the whole day here and it was worth every minute. I will always be in search of ghost towns on every trip I take. I always learn a little bit of history each time I visit one. Leaving Custer, feeling happy with the day. On the way back, we stopped in Stanley for a late lunch at the Mountain Village restaurant where we ordered their homemade veggie burger with their own homemade veggie sauce. Delicious! 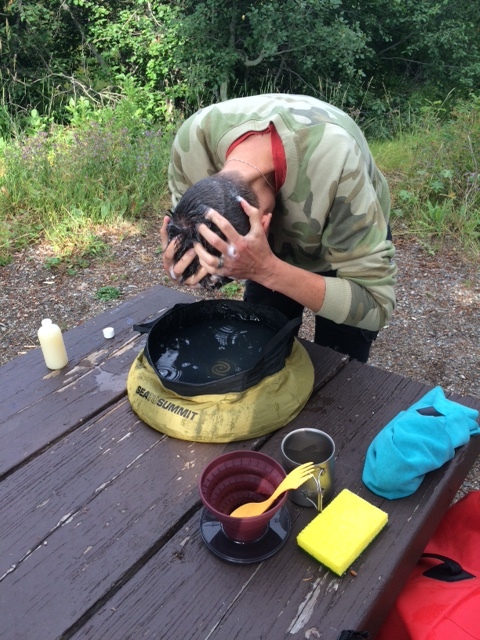 When we got back to camp, and it was time for a poor man’s shower. Afterwards, we went into the town of Ketchum and treated ourselves to a nice dinner out at an Italian cafe. After checking in with loved ones, we headed back to camp for another night of sitting by the campfire and star-gazing. I could definitely get used to this! Love the photos. Looks spectacular. This was my favorite day too! Jaw dropping beauty was right…! Thank you for sharing those! Bathtub photo: very interesting!